Lithium Polymer Battery Technology gives you longer battery life and a 2 Hour Rapid Charge to get you out faster and let you stay out longer. The GXT2000 puts communication in your hands™. Midland takes their most in-demand line of GMRS radios to the next level with the GXT2000 ! The Midland GXT2000VP4 builds on the GXT1000 and brings certain popular features of its own to provide you with the best in GMRS . Intended for outdoor use, the GXT2000 has range, toughness and long life in mind to improve performance when you need it most. Similar to its near cousin, the GXT-2000 supports 22 standard FRS/GMRS channels and 28 extra channels. Each standard channel supports 142 privacy codes to give you up to 3124 channel options to block unwanted conversations. Midland’s Xtreme Range features up to 36 miles in optimal conditions ( normally 2 miles or less in urban conditions ) . NOAA weather channels and weather alerts make sure you keep advised of severe conditions where every you are going and Weather Scan locks you into your local weather channel to keep you tuned in to the latest severe weather warnings . HD dynamic audio delivers audio that’s loud and clear . The GXT2000VP4 also has Midland’s Whisper Mode , that allows you to whisper into the microphone and still be heard . But there’s more . The Midland GXT2000 uses an Extreme Lithium Polymer Batter Pack for optimum battery life and power , plus an ultra fast recharge to boot – typically charging within 2 hours ! This radio is perfect for outdoor enthusiasts who require extended battery life with fast charge times . The 2000 also features 10 call alerts , dual watch , an SOS siren , channel scan , silent operation , 9 Levels of hands-free eVOX , vibrate alert , multiple power settings , keypad lock and mic and headphone jacks . It also sports a large back-lit LCD display that is even larger than the GXT1000 ! 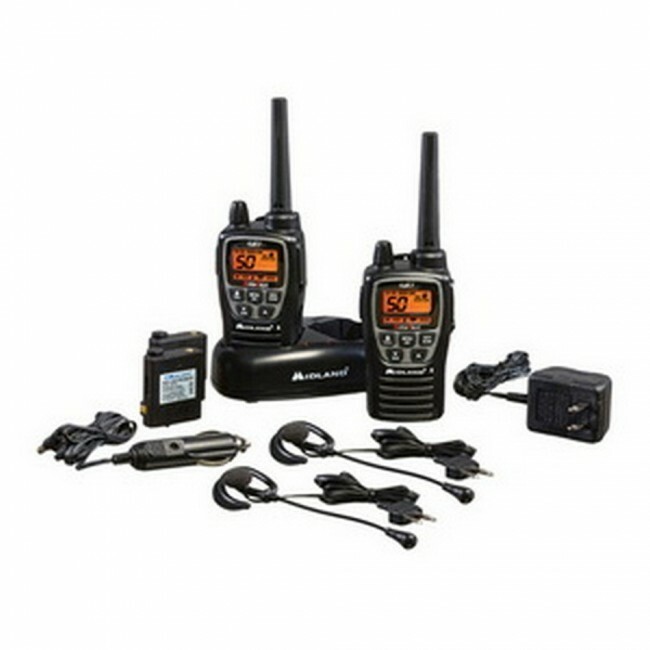 This value pack includes two GXT2000 radios , two belt clips , two Lithium Polymer rechargeable battery packs , a dual desktop charger with AC wall and DC vehicle adapters , a pair of headsets with microphones , an owner’s manual and a three year manufacturer warranty from Midland .